PixMob Video will be used for the first time outside of the Super Bowl by Tiësto as part of his residency at Hakkasan Las Vegas beginning tonight and then at the remainder of his shows there in 2014. 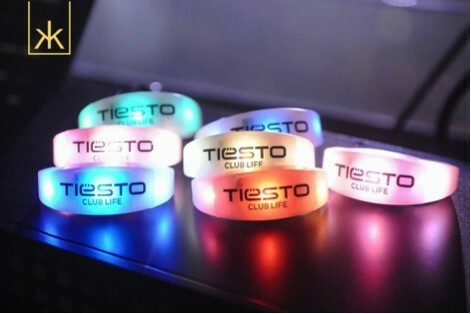 2,500 clubbers will be wearing LED wristbands generating wireless video effects in sync with his music. Pulsating with light as one organism, the crowd will become a canvas for Tiësto’s visuals, creating an immersive experience seen only at the US Superbowl. PixMob’s technology uses infrared to send instructions wirelessly to pixels worn by audience members, creating colourful light effects across a crowd. The newest adaptation allows show producers to create live video effects using the audience as a canvas. This patented technique allows for real-time transmission of colour information onto any number of mobile pixels at hundreds of thousands of individual locations up to 300 meters away, without the need for geo-location. As easy to use for in-house lighting directors as it is for the engineers who developed the system, PixMob Video is controllable via computer. A video server sends a video feed to transmitters, which then send instructions to pixels at over 100,000 locations over wireless infrared in real time. The pixels then changes colour according to the information received, allowing the lighting director to include the crowd in a creative vision.